Genetic test that could detect oesophageal cancer up to 8 years earlier presented at UK cancer conference. 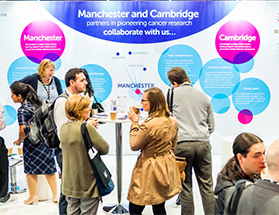 A new genetic test could help diagnose oesophageal cancer up to 8 years before symptoms appear in people at a high risk of the disease, according to new research presented at the National Cancer Research Institute’s (NCRI) Cancer Conference in Liverpool this week. University of Cambridge researchers looked at tissue samples from people with Barrett’s oesophagus – a common condition of the food pipe that can develop into cancer in around 5% of people. They retrospectively identified predictive genetic markers in 94% of people who later developed early signs of oesophageal cancer and were able to spot these markers in samples that had been taken many years before symptoms appeared. Samples used in the study had been taken during routine endoscopies for Barrett’s oesophagus over a period of 15 years. To develop their test the researchers compared the markers between 45 patients who went on to develop early signs of oesophageal cancer and 45 who did not. There are no tests that accurately predict the small number of people who have Barrett’s oesophagus who go on to develop cancer. Instead, almost all people with the pre-cancerous condition have endoscopies every few years. But, this new test could mean people with high risk genetic patterns can be closely monitored for early signs that cancer will develop, helping diagnose the disease earlier when treatment is more likely to be successful. This also means the majority of people who are at a low risk of developing oesophageal cancer could have far fewer endoscopies. The research was funded by the Medical Research Council, and received infrastructure support from the Cambridge Human Research Tissue Bank, which is supported by the National Institute for Health Research (NIHR) Cambridge Biomedical Research Centre, and the Experimental Cancer Medicine Centre.